Today we've shared our first impressions of Devil's Third, which aren't particularly positive. Focused solely on the single player campaign for now, we've highlighted concerns with performance, design and a range of factors. In some respects it's silly fun, but there are a number of issues hindering our enjoyment with it so far. In any case, the past few days have brought more rumours and whispers about the situation of its arrival in North America, and it seems like a good time to dig into the likely realities around what's being said. As a catch-up, it began with an Unseen64 report into the issues with the game, which we certainly agree with, and the revelation that while Nintendo is publishing Devil's Third in Europe and Japan, Nintendo of America seemed set to skip it. Siliconera then reported that another company would likely pick up publishing duties [Correction: Siliconera didn't name XSEED or any specific publisher, so we've amended this line; XSEED, which has experience bringing games like The Last Story to Wii, was cited in subsequent rumours as the company in question]. Nintendo of America then subsequently published a tweet suggesting that it plans to support the game in the region, however, contradicting these reports. This has prompted a backlash against the initial rumours, including Unseen64's Liam Robertson, a source that we trust and have collaborated with in the past. Recently, though, a whole load articles have popped up citing sources in Nintendo of America suggesting that the aforementioned tweet is effectively a u-turn in response to fan reaction. Nintendo World Report is one example citing this line, implying that the early rumours were accurate, yet prompted a change of policy at NoA and that the subsidiary is now considering publishing the title. Rather than skip this we've caught up with a few sources and seen the basis for these u-turn reports, and they appear accurate. We had a chat with former Nintendo Force and Dromble writer Emily Rogers, for one, who referred us to multiple authoritative sources and journalists that reinforce the original suggestions that NoA didn't wish to publish Devil's Third, and the follow-up reports that it's now contemplating a reverse in course. Rogers gave us the following quote, which is also representative of further evidence we've been shown off the record. I've spoken to multiple sources with contacts in NOA, and I can confirm that XSeed was being considered by NOA to publish the game. There were people inside of Nintendo's Treehouse who didn't believe Devil's Third was a quality game. Unseen64's report was correct. Of course, sources are still ultimately rumours, yet there are a number of individuals we know well, respect and trust that are reinforcing this narrative. As it stands we're inclined to believe the basic outline that Nintendo of America did plan to skip publishing Devil's Third in favour of leaving XSEED to pick up the reins, but that a minor public storm prompted a change of course. Whatever the ultimate truth, details will likely be announced soon for the publisher and release date of Devil's Third in North America. This game had so much potential. If it isn't optimized well and the gameplay is broken then they should just pull the plug. Or at least sold as a digital release alone. "I think we should skip on publishing this." "WHY AREN'T YOU PUBLISHING THIS!?" "WHY DID YOU PUBLISH THIS!?" The fans have done well regarding this, how about fixing up those "NX being weaker than PS4" rumours next! Siliconera never said Xseed were publishing the game. People put too much stock in rumours. $20 says that this is just a false rumour and now after being proven wrong they are just now saying that Nintendo changed their minds to cover their error. @EllenJMiller I just hope the online servers stay up for a long while. That reminds me, when do you think we'll get an Excitebike sequel? Or maybe Unseen64 was right all along, and you are just doing mental gymnastics to support your belief that he was wrong about everything? I find it very hard to believe that NOA did a U-turn based on fan feedback. In fact I find it laughable and ludicrus. How many people in the US wanted the regular sized 3DS and face plates? How many people signed that petition to delete MPFF? amiibo shortages? amiibo retailer exclusives? Wii U $299 3 years later? NOA - DT isn't very good, let's see if Xseed wants it. NOA - Oh well, it's a finished game, Wii U line-up is swiss cheese, let's publish it. U-turn based on a failure to shop it around isn't the same as Nintendo of America listening to fan feedback. They don't do that. I was really looking forward to this, but the finished product does look poor in that video. I'll still likely buy; it's not often we get a Nintendo exclusive "mature" shooter... may wait for a price drop though. @rjejr Agreed… makes much more sense. Nintendo has never been one to respond so quickly to fan/customer input or complaints. Even when they do respond, it's usually in the form of and explanation why they are right/why you don't understand/sorry not sorry. They are not known for being agile or responsive… especially when it's not a first-party product. @EllenJMiller That's a good point about the print run. It's the kind of game I'd usually wait to pick up later rather than at launch, but in this case that may come back to bite me later. @Tsusasi And what fan feedback would there even be? We've not seen a whole lot of the game to begin with. @JaredFogle I'm just using the law of averages regarding rumours - 99% are false, even if there is a genuine source people get things mistaken or hear old news or hear about a slight possibility and think it is genuine. The people who would definitely know wouldn't be telling. STOP IT!! My mind can only take so many contradictions!!! @rjejr I find your theory very believable. It really doesn't make sense that the stubborn riders at NoA changed their mind on the game (which they stated lacked in quality, a claim reinforced by NL's hands-on report) just because fans were throwing yet another tantrum, especially since the outrage at other decisions they rigorously defended ended without any impact. @rjejr But, but Reggie is a puppet remember Lol. I don't believe it either tbh. Why u-turn on most likely a potential flip. Just cut the losses now and move forward. It's not like they can't take criticism that for sure. I'm 100% positive more people complained about New 3ds not being brought over then Devil's Turd! I can see them saying awe crap, now we have to bring this game out that we said we saved last year. Why did they do this to begin with? If Microsoft and Sony didn't want it why would Nintendo fans want it? Bayonetta 2 was different imo. It had already in my mind a successful following. Nintendo should just dump the publishing duties for this turd to third parties in every region and forget this game ever happened. I think rjejr's theory for the U-turn is more plausible than a response to the fan outrage, although in recent times I believe the latter has become a little more probable. After the immense backlash received by the Nintendo Digital Event in E3 2015, any business with a bit of common sense would become warier of public opinion on its decisions and maybe change said decisions accordingly to mitigate further negativity towards the company and its policies. I know Reggie insists in sugar-coating everything about E3 and puts on a facade of confidence in the announced products and the future fan reaction upon their release, but behind the PR bulldung they're still nervous for sure. However, the key point here still stands - in all likeliness, Unseen64 were correct in their information. Again. So I'd advise the haters to stop trying and failing to find ways to discredit them because by this point it's nothing short of pitiful. @MikeW or... Y'know you could try playing it first. I personally don't see what's so bad about the game. Not that I was planning on getting it, but this video made me consider it slightly since it's actual gameplay rather than trailers. I'll wait for various reviews and its price (maybe until a sale) to see if I'll get it or not. It's sales will ultimately be determined by its quality but this rumour of NOA not publishing it has definitely caused some major negative PR. Bayonetta 2 shows that resurrected 3rd party games can be done right on Wii U.
I think Devil's Third has had too much chopping and changing over the years. It's probably a combination of complicated hardware and the developer not taking enough time to iron out the problems. But is it Nintendo footing its development costs as well as publishing it? Maybe Nintendo are just trying to cut their losses as economically as possible. Damn if you do, Damn if you don't. That should be Nintendo's new slogan. People have just as much right to discredit Unseen64 as people have to defend them. Ultimately the game is coming out, whether or not Nintendo published it, so thats all that should count right? I'm not disagreeing with Nintendolife's impression of Devil's Third (even though I'm still picking it up), but all this is part of the reason why most third parties have ditched Nintendo. Is Devil's Third really much worse than most third party games that have released on the Xbox 360 or PS3 over the last few years? The big problem here is that the moment a third party develop a game for a Nintendo system that's deemed to be 'not Nintendo quality' (and let's face it, very few third party games are), then pretty much every reviewer slates it, Nintendo themselves even refuse to promote or highlight it much and it goes on to sell poorly, alienating more third parties and reinforcing the old mantra that only Nintendo games sell on Nintendo consoles. 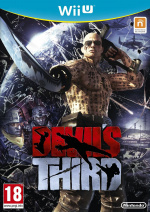 If Devils Third had been developed for Xbox or Playstation, you can bet that it would be getting hyped and people would be excited for it, regardless of whether it was a bit 'janky'. Now, I'm not saying we as Nintendo fans should drop our standards....far from it. But there is a place and a market for games like this and we should be accepting them more, rather than tearing them to shreds before they've even been released, or we've even had a few reviews at least to compare, and then wondering why hardly anybody is making games for Nintendo consoles anymore. In the end, did it matter? It was going to be published by someone. for clearly stating what needed to be said. I'm particularly glad that these lovely children were here today to hear that speech. Not only was it authentic... it expressed a courage little seen in this day and age! @blackice85 'has never been one to… ' referring to their track record. Also, in direct response to another post that references the articles' mention of fan reactions to Nintendo supposedly not publishing the game and in response to everything about this rumor. You know... The entire article above about the rumor that speculates that Nintendo did a u-turn due to fan 'outrage/reactions/fanboy entitlement'? So, yeah… all of that. Glad I could help. In spite of the apparent quality issues, I appreciate if Nintendo decides to publish this game. Sure, it's a good thing of a company tries to maintain certain quality standards for its products, and even more so in the case of Nintendo: part of the company's reputation is due to the fact that you can usually be sure that a game published by Nintendo is at least "good". However, it's just as important that a publisher is reliable in terms of its support and its plans. Not only would it have seemed weird if the other branches of Nintendo publish this game and NoA not, but what is more: if Nintendo has decided to back a game, to publish it, to announce and to present it publicly, then they should stick to their decision. A mere mediocre quality is no excuse to disappoint players as well as the developer (an unplayable mess of bugs would be a different story, of course). Yeah, I don't buy it. If NOA didn't change their mind over Operation Rainfall then there is no way they'd change their mind over Devil's Third, especially over a weekend. At this point the original rumour could still be true so best to just leave it alone until Nintendo is ready to share more. @C-Olimar if you're looking for physical... I would follow the @EllenJMiller idea and buy early on... Cause I agree, most definitely feels like a short print run! @Sir_JBizzle Not if the facts show that it was the truth. That's how crediting/discrediting works. I wonder if NoA was able to try to get out of publishing this because it was slated for later in that territory, while NCL and NoE were too close to deadlines when they realized this had quality issues. The truth is that those with a Nintendo console who want to play this type of game will only do so if it is good. That is why many games of this type have fared poorly recently on Nintendo consoles while getting decent sales on the competing consoles — Nintendo owners expect quality. That is especially true for first-party releases. I think you're missing the point of my whole comment. I know how credit/discredit works, dude. Perhaps "discredit" is the wrong term to use, I admit. You'll continue on doing what you do whether people say you're wrong or right, sometimes you'll be right, sometimes you'll be wrong. It's just the nature of mantle you've taken up. I personally don't care either way. I just care about the game being published at all. There's just no need in one side bashing the other over opinion. And obviously there's no place in bashing a guy who was just trying to do his job. @Sir_JBizzle "There were people inside of Nintendo's Treehouse who didn't believe Devil's Third was a quality game. Unseen64's report was correct." There you have it. From the horse's mouth. Why are you making a big deal out of this rumour? Technically NoA didn't make any U Turn. They didn't officially announce that they're not publishing it after they announced last year that they will. Unseen64 and Co (including NLife) are to blame here. The way I see it you guys are now covering your asses should Nintendo go on and publish the game. Although on the bright side, the game is getting a lot of publicity. I have resources telling me that NX was supposed to be a wormhole creator, some kind of space time continuum bender machine. Unfortunately, while the rumors were 100% true, multiple sources point to Nintendo of America U-Turn on the time machine/wormhole space time continuum machine. I'm still as credible as Unseen 64. Unseen64 report = horse's mouth. Gotcha. Though @rjejr point basically said that NoA thought the game was crap, so yea, I'm not sure why you directed that quote to me. Listen, you don't have to defend yourself to me, like I said, I recognize you're just doing your job, I also recognize that Unseen64 has been right on occasion, so I have no qualms but if you're just going to take the parts out of my overall comment to do what you want with, there's really no more need in me continuing a dialogue with you. @Splatburst The point was to look at what was being said, follow up on some of it with a few people and share a clarification based on what seems to be the case. Courtesy of the web deciding to harass people it decides are wrong on something, I though clarity wouldn't do any harm. As these reports on a 'u-turn' appear to be valid, I decided to share it. As I say in the article, it's not 100%, but the weight of sources seems pretty heavy. It varies, anyway, sometimes I skip these merry-go-rounds, but there were people with good intentions and a strong track record being called liars due to a vague NoA tweet, which doesn't seem fair to me. @Sir_JBizzle I have no problems with you disagreeing, but you seem to be implying that Unseen64 is behind all of today's revelation and that we are some how the sources for Emily's information. That is factually incorrect. We are not. She, and many other sites, have revealed today directly from THEIR OWN NoA sources the truth about the situation, as printed above. Neither myself or anyone from Unseen was related to this. Believe what you want, but you seem to be under that misconception so I am simply correcting you. @MadAdam81 Exactly what I was thinking. I don't know...extremely hard to believe considering it took Americans a year of begging and pleading to get NOA To publish Xenoblade not too long ago. A critically claimed game. NOA should of stayed quiet until all the (assuming) bad reviews roll in from Europe in a month and just let it fade away or give the option to xseed. I don't want to believe NOA made a u-turn on this decision in response to internet people saying 'WTF!?!' in a time span of a few days considering the crap they pulled with Xenoblade. Does not seem professional at all. Furthermore: I understand the unseen64 guy is a trusted source but, everything he disclosed was reported as a RUMOR not official. It's ridiculous coming just mere weeks after Nintendo so brazenly ignored it at E3 - the biggest stage in The U.S. for video games. And now, they're showing their hand because a 'rumor' called them out rather than disclose it ahead of E3. Doesn't make any sense why Nintendo issued a tweet in response to a rumor. So let me get this straight. Nintendo supposedly changed their minds before confirming or denying dropping Devil's Third, therefore rendering all "rumors" false sense we have no basis of truth, only rumors, because someone jumped the gun on rumors and won't confirm them to "protect unnamed sources"? I hope Nintendo finds and prosecutes the rumor people, and Unseen64. Don't get me wrong, rumor wars are cute. They show just how childish and flippity-floppity these "mature gamers" on the internet are, but these guys are violating a non-disclosure agreement (that we all know Nintendo made them sign) from a very private company, and they still deserve to be punished for it. I remember how hard they brought the hammer down on the fan who leaked Pokemon XY pictures on the internet, imagine what they'll do to legally bound employees! why are nintendo aiming for perfection anyway with every release? no game is perfect For everybody , at least give it a chance unless its broken ,the days without social media this would have never happened and critic reviews overshadow cult player base , games which were rated average and never supposed to span mass audience have become cult classics thanks to the players not the critics, i feel that age of finding thise gems has now gone thanks to media hype of the industry. Oh god who cares who publish it just give people that want it the damn game. Perhaps I'm missing something, but I don't get why this is such a big deal. It doesn't matter who publishes it as long as someone does it. @ToxieDogg After Watch_Dogs and Assassin's Creed Unity, I don't really think people would defend it on the other platforms either. At this point the game isn't what I was hoping it was going to be, that is to say a quality game, which makes me angry that even with Nintendo's support it didn't turn out that way. That said, I'm quite sure I won't be paying $60 for it and am only interested in the MP portion of the game at the moment. I'm just giving a blanket reply to all the people I didn't reply to, yesterday's Camp Miiverse thread kind of wore me out. I'm glad so many people agreed w/ me for a change. "There were people inside of Nintendo's Treehouse who didn't believe Devil's Third was a quality game." I still say that matters, even if everyone here asserts that with "patches and DLC" a game can become good. You guys always complain about NoA, but I personally feel like they might have been right with their first instinct based on that preview. Well, I guess the rumor about the NX being weaker than a PS4 is true, then. @argh4430 No. It just means that this whole situation gets more and more confusing as the topic continues. I don't believe for a second Nintendo reversed course because of some posts on the Internet. I think it's because things got ugly between them, retailers, and Valhalla. I've said before, I've heard this game advertised in GameStop numerous times. Pre-orders have been going for over a year at retailers. I think they wised up and realize it's too late to back out and hand over all these contracts to another company. They have to deliver this game now, even if it's terrible. Nintendo u-turn? When did they say they wasn't publishing it exactly? This is like going to a party at McDonalds and me claiming Ronald is now a girl with blue hair.......... Then when Ronald walks out with his usual red hair me shouting omg McDonalds in u-turn shocker. @gamermole When did they say they were? @Monado_III Well that kind of makes the discussion redundant since no one knows for certain whether they are or aren't publishing the game. Just can't seem to gather any care for a game that by all accounts just isn't very good. Whatever I want it give it already. @rjejr good point I agree!! If they DID listen to us they wouldn't still be doing 1 vc game a week!!! Haha yep. I've always thought that would be a perfect slogan for Nintendo these days. @rjejr Agree totally. If fan feedback had so much power and influence, many things would have been different in the past. I remember thousands of people demanding Nintendo do a deal with the Minecraft devs (before Microsoft bought them out), to get a Wii U exclusive version. Nothing ever came of that. "[Correction: Siliconera didn't name XSEED or any specific publisher, so we've amended this line; XSEED, which has experience bringing games like The Last Story to Wii, was cited in subsequent rumours as the company in question]." And this is why news should not rely upon a rumor mill... Also, agree with @rjejr .